Finally available worldwide after a soft launch in Canada, Fightback (Free) is something of a unfortunate tale. Ninja Theory is a fairly major developer known for decently-playing action games with excellent production values. They’re perhaps most famous for the controversial DmC, where they ended up taking the brunt of the anger of fans over choices that were largely directed by the publisher. It’s odd that they’ve shown up on iOS with such little fanfare, but perhaps it’s for the best, because Fightback is an exhasperating combination of great gameplay and fatal F2P mechanics. 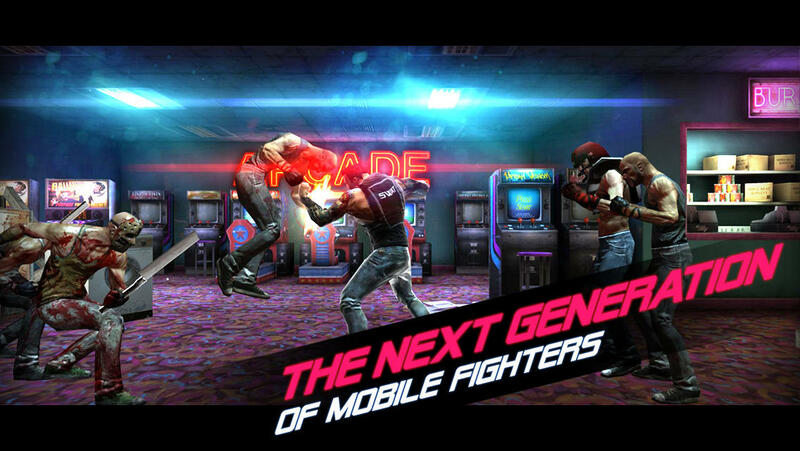 Fightback is a side-scrolling beat-em-up, more along the lines of the classic Irem game, Kung Fu, than Double Dragon. You play as Jack, a vaguely Schwarzenegger-esque fellow with a military past. Your sister has been kidnapped by an evil gang leader named Drago who has an axe to grind with you, and you have to battle through the floors of various buildings to try to find her. Assisting you is your old commander, Captain Dan, and a sleazy gun merchant. The game has a great 1980s action movie charm to it, not just in its story but visually as well. From the neon title screen to the grizzled beret-wearing advisor to the enemies inspired by 80s horror flicks and The Warriors, everything here seems to recall what is in my opinion the golden age of Hollywood action flicks. Rather than try to fumble around with different solutions for moving your character around the screen, Fightback simply puts you in the middle of the waves of goons, letting them come to you. Your attacks are performed by swiping and tapping, a system that works quite well. Basically, the game is played by allowing enemies to approach and attack, evading, and then counter-attacking, all while keeping an eye out for the next enemy. The bad guys will occasionally drop weapons that you can use temporarily for a little extra punch, but that’s more or less all there is to it. Jack has quite a range of moves, though, despite the fairly simple approach. He can punch and kick high and low, do jump kicks, sweep kicks, and uppercuts. You can even bring a gun to the fight, though the bullets are a bit costly, so you’ll want to use that sparingly. The story progression involves working your way through skyscrapers, floor by floor. Each floor contains a number of waves of enemies, who you have to defeat within a time limit. A boss waits for you on the top floor of each skyscraper, and if you can take them down, you can move on to the next building. After you clear each floor, you’ll get a star ranking based on how well you did. These stars translate out to a cash bonus that you can use to upgrade Jack or buy things with. Like most free games these days, there are two currencies, with the premium currency mostly earned by leveling up. It trickles out very slowly, and a number of items can only be bought with it, though I wouldn’t call any of them necessary by any means. A bigger problem is that the regular currency also flows a bit too slowly, and you really do need the upgrades it provides to progress. You can play perfectly but if Jack isn’t strong enough, you won’t be able to finish some stages within the time limit. The game will nag at you to buy this, that, and the other thing, mostly in the form of temporary boosts like vests and bullets, but if you’re wise, you’ll put most of your money into the actual permanent strength and defense upgrades. You can also spend the cash on new weapons, which is self-explanatory, and new tattoos, which in addition to having a cosmetic effect also give you access to different boosts. Fightback is pretty much in a perpetual state of asking you to spend the money you’ve made. It’s really hard, in fact sometimes impossible, to brute force your way through a difficult level if you’re not up to spec. There are options for grinding cash, of course, if you need it. 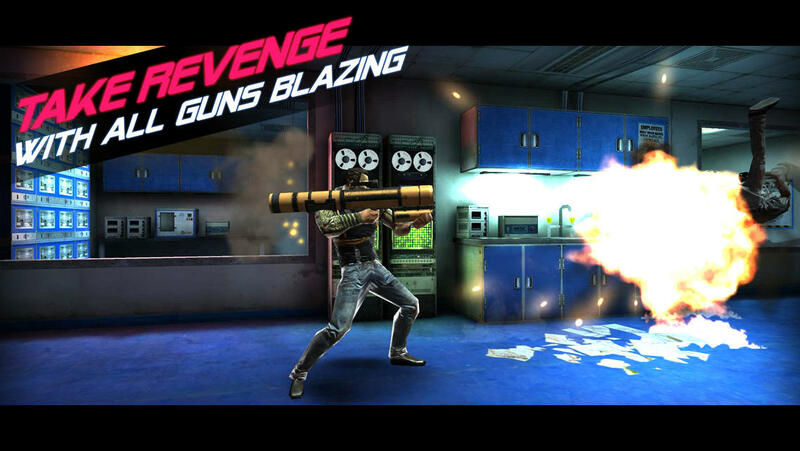 You can replay prior buildings and floors to earn some extra money, or take to the streets to battle endless waves of bad guys to collect the cash they drop. In the early going when Jack is weak, you probably won’t last too long, with your likely winnings a very paltry amount. As you get stronger, you can earn a bit more, but it’s still not enough to keep the cash flow moving smoothly. This wouldn’t be a problem except for the game’s stamina system, where each fight, win or lose, costs you a stamina point that takes six minutes to regenerate. You can’t really grind out cash in any reasonable amounts unless you’re willing to schedule the game in frequently during the day. The stamina bar caps out at six units, so you only get six rounds in any given session, which is not enough to give much a feeling of satisfaction at your progress. It ends up coming off a lot like the recent Batman: Arkham Origins (Free) game, in that the gameplay is really fun, but the stamina system causes the fun to end far too quickly, and unlike some games with stamina systems like Real Racing 3 (Free), this aspect never gets better as you progress. Jack is always only ever going to be able to take six fights at a time, whether you’re playing for the first time or the hundredth. I’d prefer to have a life system where it only costs you a point if you lose, if we have to have something like this at all. At least then, you’d be able to keep on playing if you were good enough to win. Fightback ends up even worse than Batman, though, because of the weaker economy. It asks you to buy a lot and gives you nowhere near enough to cover it, and the stamina system directly impedes grinding. It’s a bad combination. I mean, it’s a free game, so some of this is to be expected, but it feels like Fightback has too many of these monetization mechanics, and it ends up suffocating the game as a result. Playing the game is fun, but every play session feels like I’m taking six steps on a hike up Everest. I’m technically progressing, but it sure doesn’t feel like it, at all. It’s even worse when you hit a tough level, because spending a few play sessions grinding for chump change feels incredibly demotivating. Maybe they’ll fix the balance on it in time, as they are promising updates (you can’t even finish the game in its present state), but the balance hasn’t changed much since the soft launch in Canada, so I’m not holding my breath. I’m not sure who’s to blame for all of this, but the end result is the same either way. Fightback is a game that will let you have some fun, but for only less than ten minutes at a time, and only if your character’s stats and gear are up to date. It has great presentation, engaging gameplay, and it does everything in its power to keep you from enjoying either one. The community in our forums seems to have felt the same way I did, for the most part. If you’re looking for a good free game about punching guys, play Punch Quest (Free) instead. Welcome to iOS, Ninja Theory. I hope your next attempt will be a little bit more fair to the players.